Like a private post office, couriers and messengers pick up and deliver messages, documents, and packages. They may travel by foot, on bicycle or motorcycle, by car or public transit, but one thing remains consistent— their commitment to dependability, speed, and security. Depending on what they’re delivering, messengers may need to load and unload vehicles or meet a client to pick up a package they’ll carry in a bag. Some couriers have routes along which they make multiple deliveries, while others take a single package for immediate drop off. Companies often entrust couriers and messengers with confidential or time-sensitive packages. Some couriers work within a small area, such as a single business district… others are responsible for entire cities. Some messengers travel across state lines or internationally. 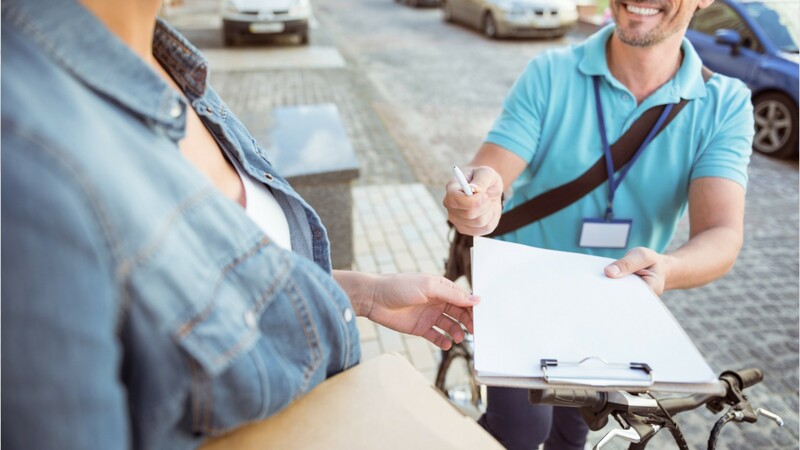 Work schedules are set based on delivery patterns, for example couriers who work within a company may work a regular schedule, while those who travel across country may have long hours, with more time off between deliveries. Many couriers rely on their physical fitness and sense of direction. Some simply walk from one department to another or ride in vehicles for deliveries. They may work for law firms, medical facilities, businesses, or delivery companies. Most messengers have a high school diploma or equivalent. See more details at O*NET OnLine about couriers and messengers. Couriers & Messengers by U.S. Department of Labor, Employment and Training Administration is licensed under a Creative Commons Attribution 4.0 International License.